On the basis of a recently published report by Transparency Market Research, titled, 'Pea starch Market: Global Industry Analysis and Opportunity Assessment 2018-2027' the overall revenue generated from the pea starch market is anticipated to be valued at somewhere around US$ 101.9 Mn in 2018, which is expected to rise at a CAGR of 7.5% throughout the forecast period (2018-2027). In the global pea starch market, the demand of pea starch is increasing owing to reasons such as increasing gluten susceptible population and increasing demand of processed food in the global food and beverage market. According to a data from Ingredion Inc., 11 million people suffer from celiac disease and more than 70 million suffer from wheat intolerance. Along with the mentioned factors the demand of the pea starch is increasing in other sectors such as pharmaceutical and cosmetic industry. On the basis of geography, North America and Europe holds the major share, in terms of value and volume. North America holds a prominent value share of 27.9% in the global pea market. 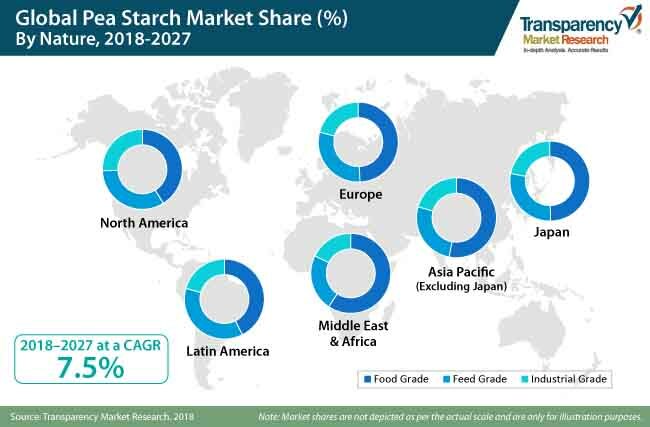 Also, regions such as Latin America and Europe are expected to register significant growth, where Asia Pacific is anticipated to register the highest growth in the pea starch market, owing to increasing global presence of key players of different industries. In Asia Pacific, the demand for pea starch is gaining the traction from the India, Australia, New Zealand and ASEAN countries, where various global players are significantly invested over the past few years. Major players in the pea starch market are focused on geographical and capacity expansion. Furthermore, companies are increasingly focusing on offering cost effective solutions for applications such as dairy products and processed meat products. Manufacturers in the region are also showing their keen interest in utilizing pea starch in their final products. With the increasing demand of pea starch in the global starch market, it can be expected that the demand of pea starch will increase over the forecast period. Pea starch is used in various ready-to-mix & eat products such as bakery products, curry and dessert mixes. Gelling, binding, and thickening of starch varies according to the ratio of amylose and amylopectin. Thus, it finds various applications in convenience food products. Baked goods with pea starch have good texture and characteristics without gluten. Global sales of ready-to-mix food is anticipated to grow 2.3X during 2014–2020, exhibiting a double-digit CAGR during this period. TMR has profiled some of the prominent companies active in the pea starch market, such as Axiom Foods, Inc., Puris Foods, Vestkorn Milling AS, Roquette Freres, Emsland Group, Meelunie B.V., The Scoular Company, AGT Food and Ingredients, Felleskjøpet Rogaland Agder, Cosucra Groupe Warconing SA, Yantai Oreintal Protein Tech Co., Shandong Jianyuan Group, Dakota Dry Bean, and Parrish Heimbecker, ltd., and others. This report contains detailed insights of the current market opportunities, drivers, trends that are driving the pea starch market over the forecast period. The report also offers detailed information in a comprehensive and comparative dashboard about the key players operating in the global pea starch market. In addition, it also includes key strategies, developments and their product offering in the market.